Floyd Clymer`s Historical Motor Scrapbook: Steam Car Edition, Vol 1. Los Angeles: Clymer Motors, ?? Before 1960. First Edition Pictorial Wraps Near Fine in Wraps 8vo (5-1/2 x 8-1/4), 224 pp. Paperbound book is Unmarked, apparently Unread and NEAR FINE in pictorial wraps (tiny shelf bump on upper right cornerand filled with photographs and engine schematics. (h) They were fast (Stanley Steamer could do 125 mph) with minimal exhaust, but needed to refill the water frequently. By the time the condenser was introduced eliminating that need, the gasoline cars had filled the gap. 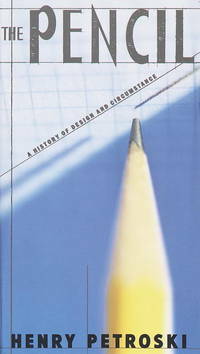 The Pencil: A History of Design and Circumstance. New York: Academic Press, 1962. Second Printing Cloth FINE 8vo (6 x 9), 586 pp including Subject Index and Author Index. (Reference notes at end of each chapter.) Hardbound book is Unmarked and FINE. All pages clean and tight. Previous owner's name written on bottom page block. Blue cloth cover has AP logo incised on front cover and title in gold on spine. Some rubbing to cover, slight bumping top and bottom of spine, but all corners sharp and clean. Still a relevant reference source. 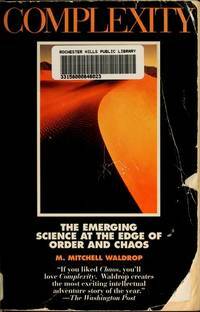 Complexity: The Emerging Science at the Edge of Order and Chaos. New York: Simon & Schuster, 1992. First Edition, First Printing 1/4 cloth AS NEW in AS NEW DJ 8vo (6-1/4 x 9-1/2), 380 pp including Bibliography and Index. Hardcover book is FINE -- Unread and with one exception -- gift inscription wrtitten on flyleaf -- Unmarked, escept for that, book is AS NEW in AS NEW pictorial DJ (n Bro-Dart Protective cover. (h) This is the story of Dr. Waldrop and his involvement in the establishment of the Sante Fe Institute, pioneers in the understanding of chaose, order, and the development of structure, all set in motion by Dr. Waldrop beeing excluded from polite society of physicists because of his heretical theory of Increasing Returns. 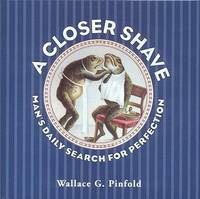 A Closer Shave: Man's Daily Search for Perfection. New York: Artisan, 1999. First Edition, First Printing Glossy Pictorial Cover AS NEW in FINE DJ Square 16 mo (6-1/4 x 6-1/4), 159 pp with illustrations. (h) Book is UNMARKED, UNREAD, and AS NEW in FINE DJ (slight shelfwear). DJ is UNCLIPPED. Informative, well-researched, upbeat and witty history of the scraping of the face (including plucking and other facial hair removal techniques). 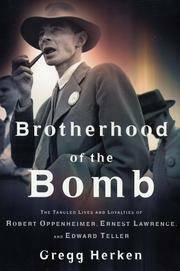 Brotherhood of the Bomb: The Tangled Lives and Loyalties of Robert Oppenheimer, Ernest Lawrence and Edward Teller. New York: Henry Holt and Co., 2002. First Edition, First Printing 1/4 cloth AS NEW in AS NEW DJ 8vo (6-1/4 x 9-1/2), 448 pp including Notes, Bibliography, and Index. Hardbound book is UNREAD and AS NEW in AS NEW glossy pictorial DJ protected in Bro-Dart plastic cover. Publisher's promotional materials included. No marks, tears, bumps -- DJ not price-clipped. Gift quality. Mr Herken is Senior Historian and Curator at the Smithsonian Institution's National Air and Space Museum. Prior to that he taught at Oberlin College, Yale, and California Institute of Technology.